For hunters like Rick Prekup, deer season is the happiest time of the year. “I go hunting every chance I get,” Mr. Prekup said in a telephone interview from his home in Horseshoe Bay. Several times each week from November to early January, he rises at 5 a.m., grabs his lucky sweater and a semiautomatic Remington rifle and drives about an hour to his hunting lease in Mason County. The start of this year’s deer season on Nov. 2 coincided with a cut to the federal Supplemental Nutrition Assistance Program, formerly known as the food stamp program. Celia Cole, chief executive of the Texas Food Bank Network, said that those cuts had left millions of Texans scrounging for new sources of nutrition and that food banks had struggled to keep up. The Hunters for the Hungry program will help offset some of the losses, Ms. Cole said, by providing needy families with a source of protein, often the most expensive part of their diet. “One of the things that’s least often donated and is hardest to acquire is that source of low-fat protein,” she said. 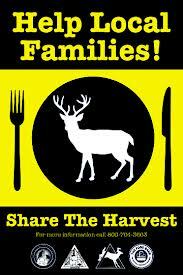 Charlie Ward, chief operating officer of the Capital Area Food Bank of Texas, agreed, saying that local pantries demanded protein-rich foods more than any other types and that venison was particularly popular. “When we put it in inventory here, it doesn’t last but a day,” he said. In some communities, participation in the program is widespread. Horseshoe Bay has a deer overpopulation problem, said Stan Farmer, the city manager. To deal with it, the city hires a trapper each year to catch roughly 300 deer, which are processed and donated to Hunters for the Hungry. In addition to contributing to a good cause, Mr. Farmer said, the program manages the community’s deer population. “Otherwise we’ll have maybe 500 deer per year get hit by cars, which is dangerous for drivers and dangerous for deer,” he said. But overall venison donations are inconsistent from year to year, Mr. Ward said. In 2011, his food bank, which serves 21 counties in Central Texas, received more than 8,000 pounds of meat donated by hunters; in 2012, that number fell to just under 2,000 pounds. Mr. Ward said the processing fee — hunters pay an average of $40 per deer — could be a hurdle to donations. Ms. Cole emphasized that charitable initiatives, while important, could not make up for the federal cuts anyway. November cuts to SNAP eliminated $36 of assistance a month for an average family, which Ms. Cole said amounted to a reduction in roughly 180 million meals in Texas a year. By comparison, Ms. Cole said, the entire Texas Food Bank Network provides about 250 million meals each year. “We can’t expect programs like Hunters for the Hungry to solve the problem,” she said.